Flipkart launched the most awaited Moto G on 6th February 00:00 and within minutes the product was sold out. The Moto G with 8GB internal storage was priced at Rs. 12,499 and 16GB for Rs. 13,999 – with launch day offers. The Moto G got listed even before 6th Feb, i.e. on 5th Feb at 23:45. However the offers were applied only after 00:00. The Moto G 16 GB version that was available a few minutes after the 8GB version, got sold out in about 20 minutes. The 8GB version got sold out within 60 minutes. I guess Flipkart had about 5000 16GB units and about 10,000 8GB units. I had also ordered the 8GB version and expect it to be delivered on/before 10th Feb. There is indeed a mad rush for the Moto G smartphone. It is not just the specs but the price too that made it to the hot selling fame. Moto G was launched on 5th Feb in association with Flipkart – their exclusive online store partner. Am not sure if this handset will be made available on other online stores or offline stores (local stores). And really don’t know the fate of consumers who pre-booked the same from Snapdeal. 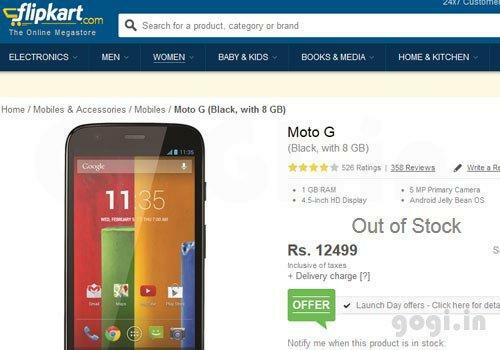 Similar Threads for : Moto G launched on Flipkart and gone in 60 minutes!